Last Tuesday morning I had to have a shower in pitch black and go to work unshaven because the managers of the hotel I was staying in did not have a monitoring system. Showering in the dark made me think about a valuable tool for all SharePoint Administrators. As a SharePoint Administrator one thing is certain and that is that at some point your SharePoint system will break. The important point though is how quickly it is back up and running. So it is vital that you know exactly when it breaks. Ideally you will know before angry users start banging on the IT Office door. So make sure if you are in charge of SharePoint either a 2010, environment or a 2007, that you have a SharePoint Health Monitor Tool. So back to my hotel room at half past ten on Monday night. I turned off the bathroom light and BANG!!! Suddenly the whole room was plunged into darkness with every electrical device dying. No red power light on the TV and no longer could I hear the kettle boiling. It was a total power-out. With the corridor also in darkness I decided to retire to my bed and wait until normal power was restored. Surprisingly the next morning the corridor was still powerless at this purple premier hotel (I had to wait until daylight so I could open the thick curtains to see the room was still purple). After performing my normal morning rituals in darkness and hoping I didn't have toothpaste down my chin I felt my way to Reception. I was expecting an apology and maybe an offer of a refund. Instead, to my amazement, my comment about there being no electricity in the corridor was met with surprise by the woman at Reception. She wasn't aware of a problem and it seemed that everybody in the rooms had assumed somebody else would have reported it. So about twenty rooms had been without power for ten hours and the hotel hadn't noticed. Incredibly the lady was also struggling now to believe the fact and even suggested that perhaps I dreamt it all. Who did she think I was, Pamela Ewing! Showing my age there with referenece to 80's soap opera. I am probably still bitter about wasting my time watching a whole series that ended up being just a dream. At least Bobby got to have a shower with the light on even if it did take over a year. The hotel staff should really have a system so they are alerted if there are any power failures. In the same way SharePoint Administrators should have a system to monitor their SharePoint. They need to know that all the SharePoint and SQL services are running, they need to know if disk drives are getting full and they need to know CPU uses on all of the servers. It is not easy to manually keep track of all of these but tools are available. 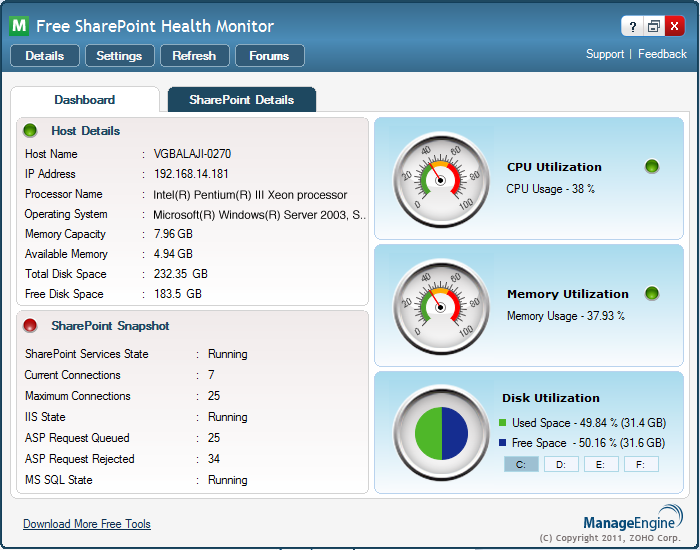 One such tool that really is a must and is free of charge is SharePoint Health Monitor Tool from Manage Engine. It really can alert you of any potential problems and unlike the hotel staff you can be alerted to panic as soon as a problem occurs not ten hours later. Even with the Health Monitor Tool it is still very important to every day check all your server logs. Now, I just hope the Villa owner Randy Learner is monitoring carefully the form of the Villa and will act soon before it is too late. He will hopefully have noticed that the boos are getting louder and the number of Villa attempts on goal is getting less each game. Alarm bells should be ringing!